System Restore can fix a number of computer issues. But System Restore is also an application that can get corrupted or become problematic. If you received an error saying “The specified object was not found (0x80042308),” read on. 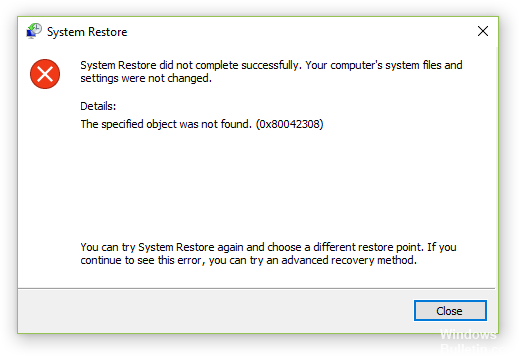 This article is all about fixing System Restore when it comes up with this error. Although there are cases when a simple reboot corrects an error, that doesn’t always work. But that’s also not the only thing you can do to get rid of the problem. When the tool you rely on to resolve software failures become the problem, these are the things you should do. Your antivirus can stop applications from launching. If this is the case, you should disable your antivirus program. If the antivirus is indeed the reason your system restore is not launching properly, try adding it to the exception list so you may once again enable your antivirus. Third party software or app are sometimes necessary to run certain processes. But they can also change the way your computer responds when changes are applied to the registry. Troubleshoot any possible third party related issues by booting in clean boot state. Type msconfig.exe on the search box. Right click System Configuration and click run as administrator. Open Selective Startup and uncheck the radio button for Load startup items and then click Apply. Go to the Services tab and put a check mark on the Hide all Microsoft services checkbox. The click Disable all and OK to disable all “non-Microsoft” services. Reboot your computer and check if the problem still persists. Right click This PC from windows explorer and click Properties. On the left side, click System Protection. Once you are on System Protection window, click Configure. Click the Disable system protection to turn it off and then click Turn on system protection and Apply to restart it. Once done, restart Volume Shadow Copy Service by going to Services. Just type services.msc on Cortana to show all running applications and drivers. Scroll to Volume Shadow Copy Service. Right-click it and then click Stop to halt the service and then click Start again to relaunch it. After these, open System Restore once again and create a restore point. This should resolve all issues with it. The restoration image cannot be written. Error 0x8004230c.